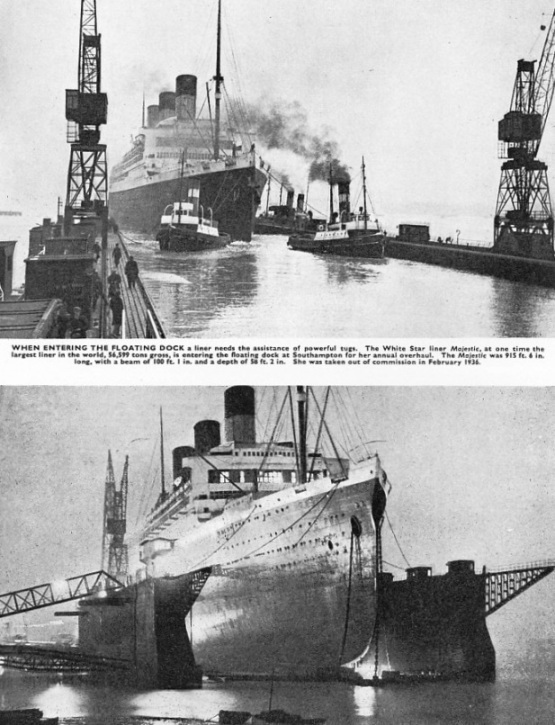 Part 33 of Shipping Wonders of the World was published on Tuesday 22nd September 1936. This issue included a colour plate illustrating Going Aloft on Board the Archibald Russell, which formed part of the article on Sailing Round the Horn. The plate was attached to page 1053 of part 33. The plate had previously appeared as the cover to Part 8. “This week’s cover shows the Rex, belonging to the Italia Line. The Rex, a quadruple-screw turbine steamer of 51,062 tons, won the Blue Riband of the Atlantic in August 1934, when she averaged 28.92 knots from Gibraltar to Ambrose Light, New York.” The illustration is by Harry Hudson Rodmel. The cover supplements the article on Italian Shipping in this issue. 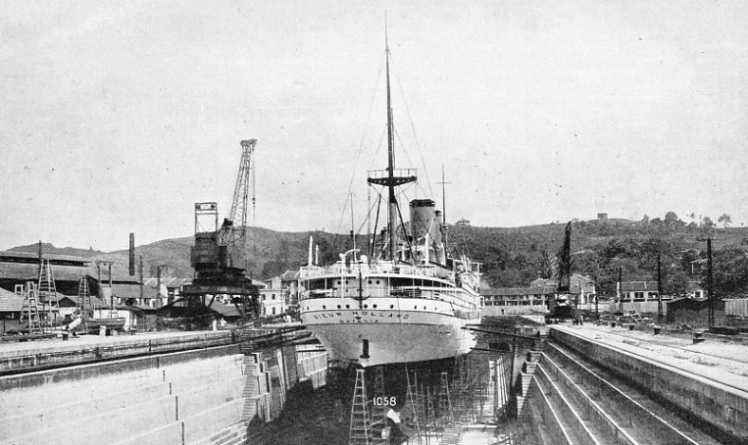 (Top left) BUILT AT SPEZIA IN 1926, the Giuseppe Mazzin is a twin-screw vessel of 7,453 tons gross, with three decks and a shelter deck. She is registered at Genoa, and has a length of 434 ft 7 in between perpendiculars, a beam of 51 ft 2 in and a depth of 28 ft 1 in. Her steam turbines are connected in pairs by double reduction gearing to her twin shafts. The vessel is owned by Tirrenia Line, comprising the united fleets of the Florio and Citra Lines. She has a speed of 14½ knots. 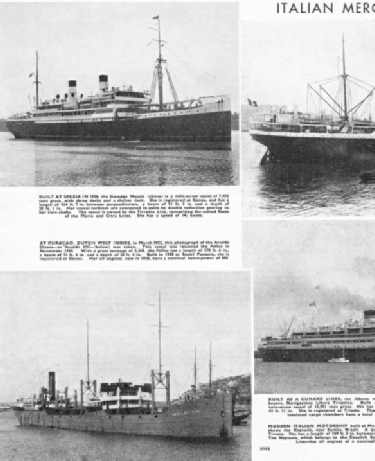 (Top centre) BUILT AS A CUNARD LINER, the Albania was renamed the California by her Italian buyers, Navigazione Libera Triestina. Built at Greenock, Scotland, in 1920, the California is a four-masted twin-screw vessel of 12,951 tons gross. She has a length of 523 ft 1 in, a beam of 64 feet and a depth of 43 ft 11 in. She is registered at Trieste. The California is fitted with refrigerating machinery. Her five insulated cargo chambers have a total capacity of 70,758 cubic feet. Her speed is 14 knots. 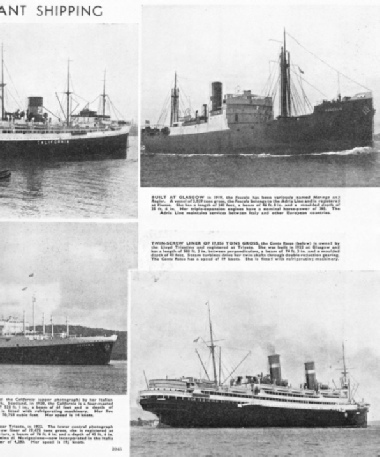 (Top right) BUILT AT GLASGOW in 1919, the Foscolo has been variously named Maringa and Rogier. A vessel of 3,059 tons gross, the Foscolo belongs to the Adria Line and is registered at Fiume. She has a length of 342 feet, a beam of 46 ft 8 in and a moulded depth of 25 ft 6in. Her triple-expansion engines have a nominal horse-power of 390. The Adria Line maintains services between Italy and other European countries. (Bottom left) AT CURACAO, DUTCH WEST INDIES, in March 1922, this photograph of the Ansaldo Ottavo - or Ansaldo VIII - was taken. This vessel was renamed the Pellice in November 1934, With a gross tonnage of 5,360, the Pellice has a length of 378 ft 6 in, a beam of 51 ft 6 in and a depth of 28 ft 4 in. Built in 1920 at Sestri Ponenete, she is registered at Genoa. Her oil engines, new in 1928, have a nominal horse-power of 606. (Bottom centre) MODERN ITALIAN MOTORSHIP built at Monfalcone, near Trieste, in 1932. The photograph shows the Neptunia, near Santos, Brazil. A quadruple-screw liner of 19,475 tons gross, she is registered at Trieste. She has a length of 589 ft 8 in between perpendiculars, a beam of 76 ft 6 in and a depth of 45 ft 6 in. The Neptunia, which belongs to the Cosulich Societa Triestina di Navigazione - now incorporated in the Italia Line - has oil engines of a nominal horse-power of 4,280. Her speed is 19½ knots. (Bottom right) TWIN-SCREW LINER OF 17,856 TONS GROSS, the Conte Rosso is owned by the Lloyd Triestino and registered at Trieste. She was built in 1922 at Glasgow and has a length of 588 ft 3 in between perpendiculars, a beam of 74 ft 3 in and a moulded depth of 40 feet. Steam turbines drive her twin shafts through double reduction gearing. The Conte Rosso has a speed of 19 knots. She is fitted with refrigerating machinery. Remarkable progress has been made in the design of great floating docks - hospitals for giant ships - in recent times, particularly since the coming of the mammoth liner has brought special problems of rapid overhaul. The earliest kind of floating dock is said to have been invented in Russia by an Englishman during the reign of Peter the Great. 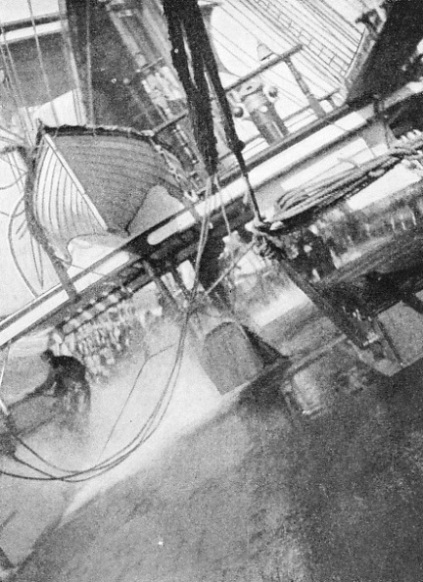 It was simply an old hulk hollowed out and fitted with a water-tight gate at the stern. From such humble beginnings have grown some masterpieces of modern engineering. One example is the enormous floating dock at Southampton, which has a lifting power of 60,000 tons. The article is by A C Bridges. 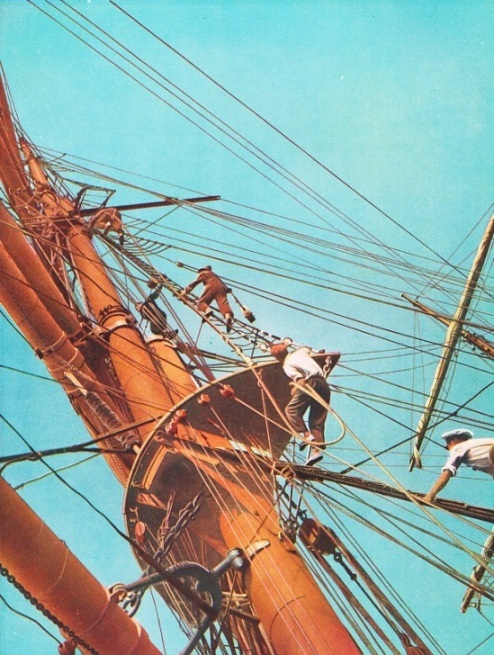 A vivid first-hand account of the voyage of an apprentice in a large sailing ship round “the world’s worst corner” at the beginning of this century. These are the days of steamships and the Panama Canal, but there are still many men who can remember the hardships and miseries of that adventurous voyage in sail round Cape Horn. Terrific wind, extreme cold and steep seas were everyday conditions, and often the supply of warm, nourishing food ran short. The courage and endurance of sailors who made the voyage round “Cape Stiff” were magnificent. The article is by Commander G. Rawson. Written from personal experience, his story not only tells of the rigours of the passage round the Horn, but it also shows us the “human side” of life at sea and introduces some characteristic old sailors. The story of the Battle of Lepanto, concluded from part 32. Two vessels are illustrated below because they represent progressive advancement on the part of motor vessels on this vital waterway. The name of the upper vessel, shown in profile only, is the Aguila II and her job is to carry quebracho, a tree bark much used for tanning purposes. The Aguila II has a length of 260 feet, a beam of 42 feet and a depth of 11 ft 9 in. She was completed in 1931 at Leith and engined with two Atlas diesels, either of 500 horse-power. The Argos is the name of the second vessel, shown in greater detail. She was completed in 1936, was also built at Leith and engined with the same type of engines. 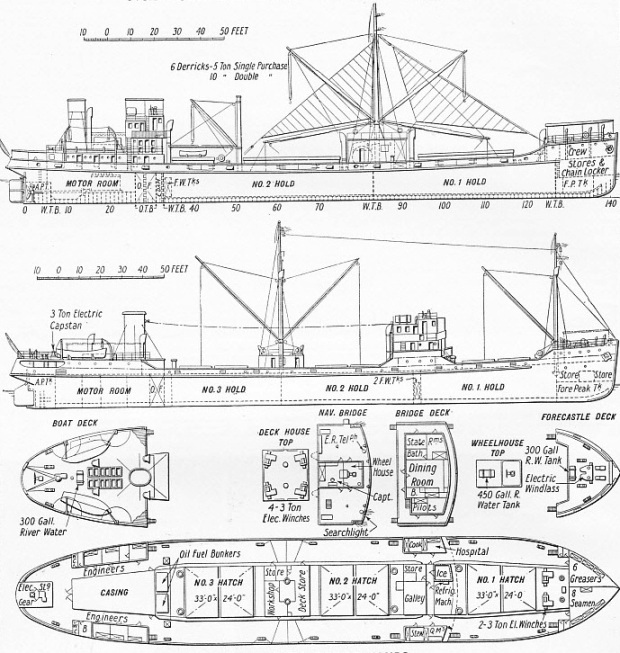 The position of her bridge, masts and auxiliary deck machinery can be noted in contrast to the Aguila II, as also the different hold arrangements. The Argos has a length of 280 feet and is 50 feet in breadth. Her load draught is 8 ft 6 in and she has a total power of 1,450 brake horse-power on two screws. This is the twenty-fifth article in the series on Merchant Ship Types. Apart from its importance as one of the world’s great ports, Singapore is particularly interesting because its commerce is set amid the glamour of the East. Formerly a haunt of Oriental pirates, Singapore is now a centre for picturesque native craft and fishermen who work by most unusual methods. This chapter is by Sidney Howard and is the tenth article in the series on Great Ports of the World. The article is concluded in part 34. VENICE’S CONTRIBUTION to the Allied fleet comprised six great galleasses - one of which is illustrated above - 106 galleys, two nefs (transports) and twenty light craft. 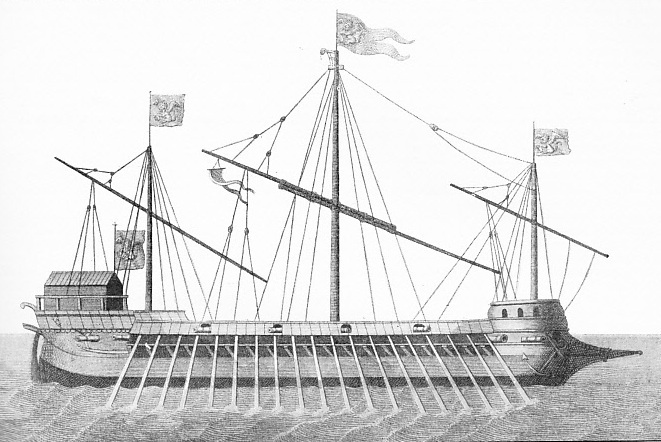 The galleass was larger than the galley as she had three masts instead of two, and was more heavily armed, She was propelled both by sails and by oars. The vessel illustrated has nineteen oars on the starboard side, which shows also eight guns distributed along her length. Thus she did not suffer from the disadvantage of the galley, which could fire forward only. The loss of land due to the encroachment of the sea is serious and spectacular. The principal cause is the combined action of waves, tides and currents. Various measures have been devised to deal with the problem, but they have to be applied with prudence and caution. Coast erosion is a subject which is very little understood by “the man in the street”. In less enlightened times the disappearance of whole villages into the sea used to give rise to fantastic and picturesque legends. Stories arose of the romantic land of Lyonesse and of the retribution which overtook the wicked Earl Godwin when his lands were engulfed by the sea. Credulous villagers would recount how they had heard the sound of church bells coming from beneath the sea in districts where submerged villages were known to lie. This chapter is by Frank Bowen in which he describes notable instances of the action of the sea on the land, and of the steps which are taken to prevent portions of our coast-line from slipping away into the sea. 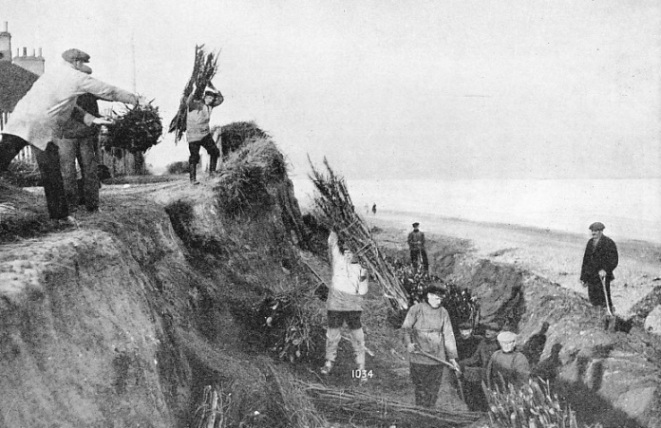 TO CHECK THE ACTION OF THE SEA, in an attempt to preserve houses situated close to the shore, members of the Kessingland (Suffolk) lifeboat crew are shown building sea defences. A trench has been dug and the men are burying faggots in it, to bind the soil together. The sea has made many inroads on this par of the East Anglian coast. Although the foundations of Italian shipping were laid in the commerce of the Roman Empire and in the medieval prosperity of such cities as Genoa and Venice, the modern Italian merchant fleet is a vigorous product of Government action. It was from a wrecked Carthaginian galley that the Romans learnt the beginnings of their sea power. From those early times, through the Renaissance period, when Venice was the world’s great merchant port, right down to the present day, Italy has held a significant place in the story of the sea. 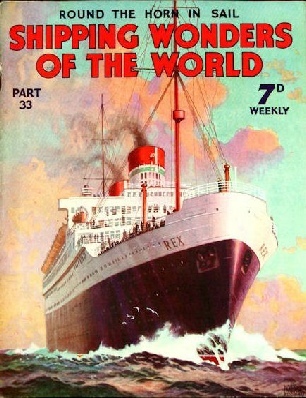 An Italian liner, the Rex (illustrated on the cover of this part), gained the Blue Riband of the Atlantic in 1934. This chapter, by Frank Bowen, touches on the historical aspect of the subject and deals in detail with Italy’s Mercantile Marine at the present time. It is the seventh article in the series on Sea Transport of the Nations. A HEAVY ROLL during a squall when rounding Cape Horn. This photograph, taken in the Garthsnaid, one of the last of the famous British sailing ships, shows in a remarkable way the angle to which a vessel may roll in a heavy sea. GOING ALOFT on board the Archibald Russell, one of the famous square-riggers under the Finnish flag. A steel four-masted barque of 2,354 tons gross, the Archibald Russell was built at Greenock, Renfrewshire, in 1905. She has a length of 291 ft 4 in between perpendiculars, a beam of 42 ft 11 in and a depth of 24 feet. Registered at Mariehamn, in the Aland Islands of the Baltic Sea, the Archibald Russell belongs to Gustaf Erikson, and is one of the vessels of his famous grain fleet, described in the chapter beginning on page 751. The men are taking a gantling aloft which will be used to hoist the sails from the deck to the various yards on which they will be bent. Since the weight of the rope is too much for one man, other men follow him at intervals to bear the weight. IN KING’S DOCK, SINGAPORE, the Nieuw Holland is undergoing examination. The King’s Dock is 879 feet long, 100 feet wide at the entrance, and has a depth of 34 feet on the sill at high water ordinary spring tides. The Nieuw Holland is a Dutch twin-screw ship of 11,057 tons gross, built in 1927 and trading between Batavia and Java. She is 540 ft 6 in long, with a beam of 62 ft 7 in and a depth of 32 ft 3 in.